This is River from Rowan somthing. 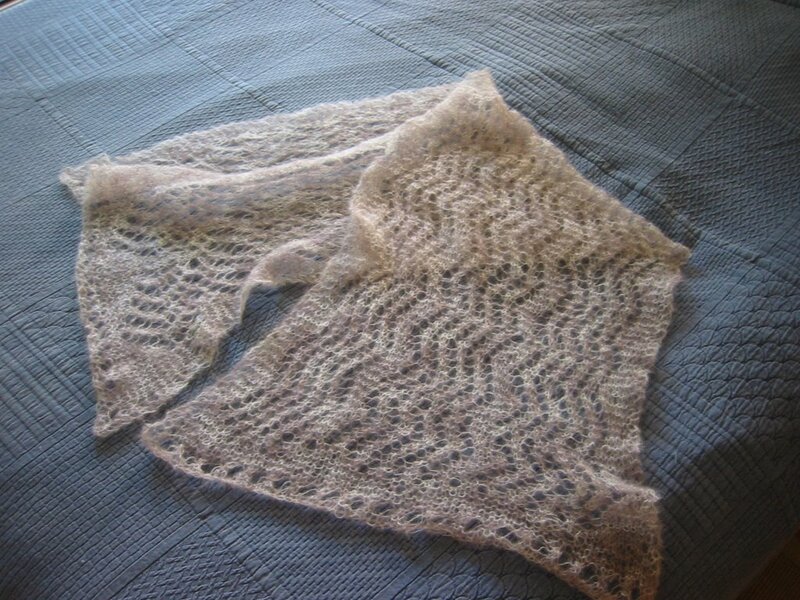 Its knitted in Rowan Kidsilk Haze - or actually the variant of KSH that is speckled. Currently unblocked - and I think I may leave it like this as a better disguise for the number of mistakes in it. Although the KSH is lovely to knit, I didn't enjoy knitting this much - its impossible to frog when you make a mistake and I had to watch every single stitch. However, Im pleased with the result. I'm hoping it will get some wear as a light cover-up for our summer evenings. 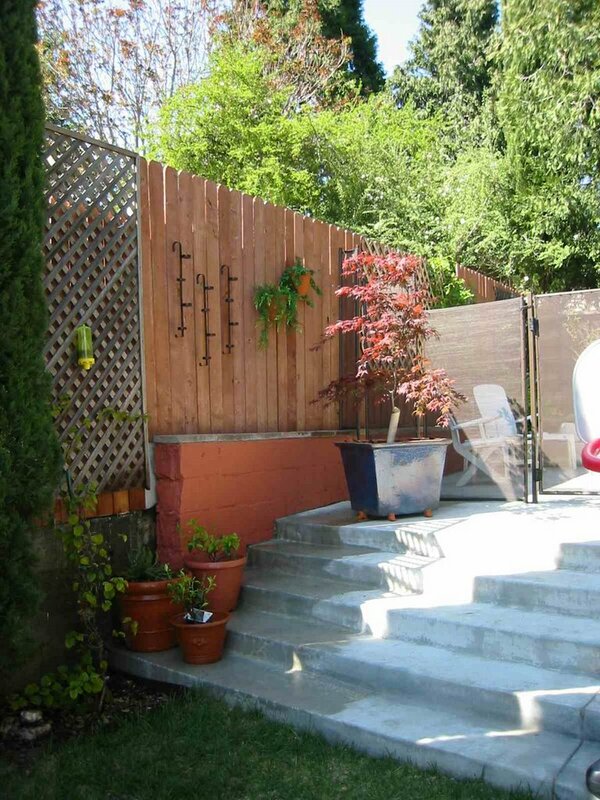 We finally got some sunny weather today - so we got to work on our garden improvement project. 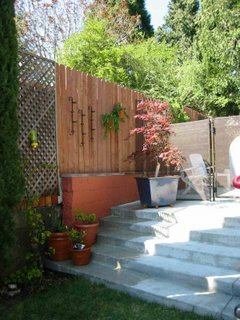 I painted the concrete wall at the edge of the steps and behind the spa with orange paint. It really hides a lot of the imperfections of the wall and looks a lot better. Here is Nigel enjoying our favourite sitting spot - you will notice that we are locked behind the pool fence - it gets us some peace! We also moved the decrepit wendy house and planted an Acer in a pot. I dug some of my nicer pots out and we planted them up too on the steps. The wall pots are from Farnham Pottery - remember those Gill? They actually have plastic ivy in them - I think that wall gets too much sun to keep stuff moist in terracotta pots. 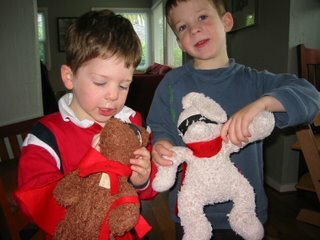 In crafty news - Adam and Finlay wanted scarves for Teddy and Bunny - so I taught them finger knitting. 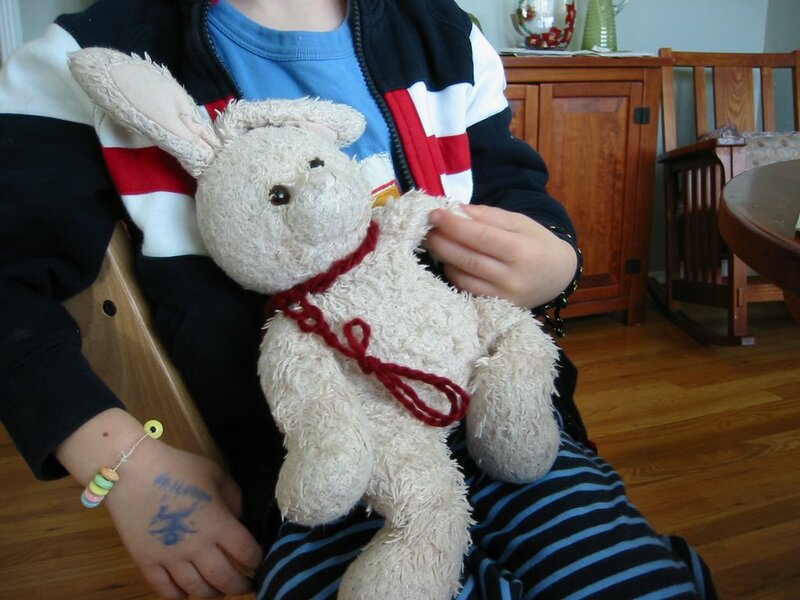 Adam actually did a lot of his own - same cant be said for F. I remember at Thornton Hough that my friends and I had huge balls of finger knitting - we never made anything with it but would compare the length we had achieved. I wonder what happened to all those hundreds of yards of it? In my knitting im on the final repeat of River - I should photograph it now when it looks like a mess of cobweb because once its blocked the many errors will be more apparent! 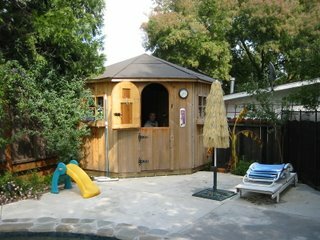 We had a productive day today...see our new home office! 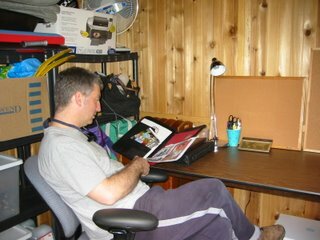 We thought it was just like old times - except that we now have 2 children who were not around when we were doing all the work on the house. Nigel laid a plywood subfloor, then I laid a vinyl tile floor. We were both glowing with the satisfaction of a job well done - although in our case this is more a question of chance than anything. Once we moved the furniture in it was quite homely. In fact its a good sight nicer than my office at Cottle Road - at least it has a window. So unless it turns out to be unbearably hot or cold (and we have a radiator and a fan to cater for each possibility) then Nigel and I might be fighting over our new workspace. If its too hot or too cold we'll be fighting inside! We eased our aching legs in the spa with the boys. Tomorrow is weigh-in day. I'm not expecting much given how much chocolate, nibbles, wine, etc that I gorged on yesterday. But back on the wagon today. Weight loss so far is just over 5lbs. 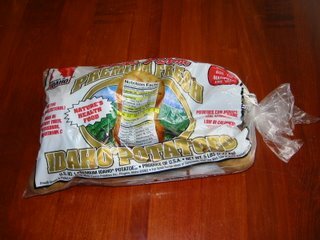 That does not seem much really; was not hard to lose, makes but a small dent on what I'm trying to achieve, however, to put it in perspective here is 5lbs of Idaho's finest. When I showed Nigel he was astonished that 5lbs was really that much - I suppose that in fat it is denser and therefore less volume - but it's quite a weight to haul around when you dont need to. I knew I had been keeping 6" of black grosgrain ribbon for just this purpose! 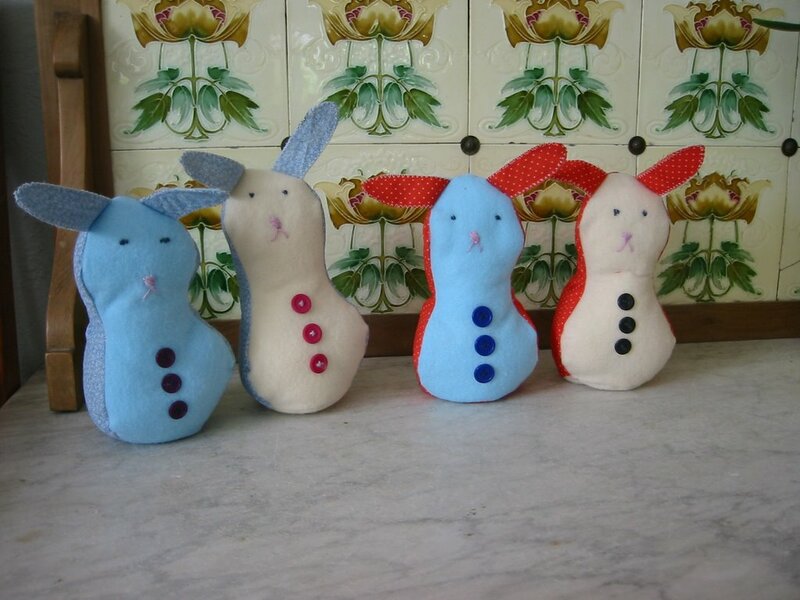 Happy Easter from all at LG. They were really quick to make and the children liked them. 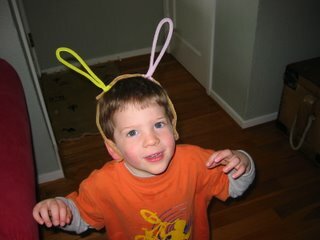 They also joined in the preparations for the Egg Hunt party. 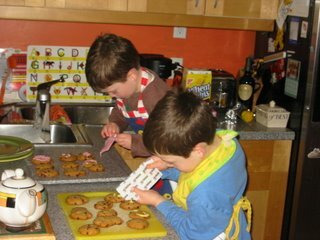 Here they are icing cookies with some luminous icing. It finally stopped raining at about 1pm so we all dashed outside to do the egg hunt, then all the children gorged themselves on chocolate. The adults had to make do with nibbles and wine. 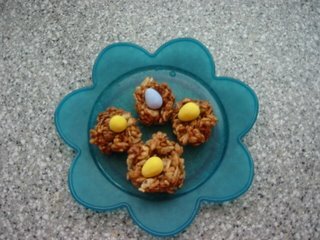 Since we are having an Egg Hunt here on Sunday we started preparing the exotic eatables today. I know that at Duncan's you all ate lavishly of traditional English fare - but hey, some of us are Americans. How can you resist cooked something with ingredients of marshmallows, chocolate, and rice krispies? 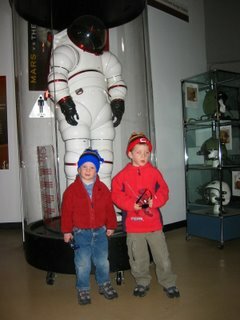 Im not sure that this is Weightwatchers-friendly, but the boys had a great time. Well, I'm knitting away but cant show any of it as the intended recipients are the only readers of this blog so I cant pretent that the stuff is for anyone else. Apart from maybe Nancy who I dont think is a reader - but then again - the top for her did not turn out so well so Im not sure I need to show that. In other news - I wore my too small jeans today...hee hee. They were not exactly comfortable or anything but at least my tum was not hanging over the waistband like before. I need to remind myself that WeightWatchers really does work - especially if you follow the plan! I was going to post a photo, but then I thought "my bum...on the web?" so I didnt. LG actually holds its annual Easter Egg hunt the weekend before Easter. We went down to scrabble for eggs - but decided to leave before the egg part and have a private egg hunt in the garden. 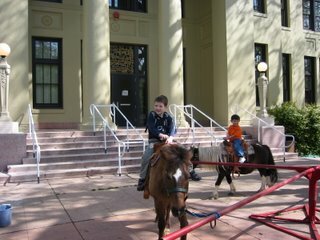 We did get a chance to ride on the tiny ponies: Adam on his pony (note the Western saddle). I have finished my black cardigan. it was a really nice knit which is lucky as this is the second time I have knitted it. The first time I made it too large and it was rather more of a kimono cardigan than I intended. Mammie was a happy receipient of the larger cardi (despite being actually smaller than me). My version was knitted in Elsebeth Lavold Silky Wool which knits up into a really nice soft fabric (sorry Fabrrrrrrrik) although it seems to have a lots of bits of vegetative matter in the yarn. 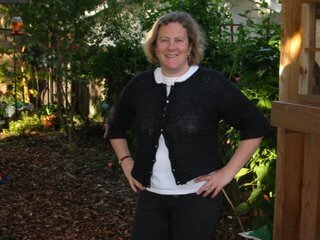 I knitted the second cardi in a smaller size and tried it on at various stages to ensure that the fit was what I wanted. It turned out just great. My crochet ruffles are a bit wobbly but they did press out pretty well and the wonkiness is not apparent to the unobservant viewer. I wore it to work on Thursday and was really pleased with how it looked over a fitted white shirt with black trousers. It was nice to dress up a bit for work - sadly this outfit counts as dressed up compared to my normal attire to work which is very casual these days! This is the cake that the boys and I made. 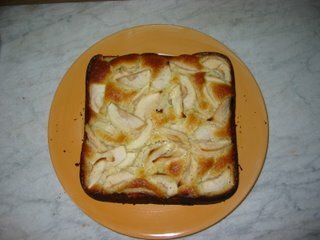 It's Turid's Norwegian Apple Cake. 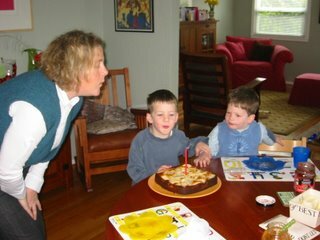 This is us blowing out the candle (fortunately not 43 of them) prior to eating the cake. Yes, that is breakfast - why defer gratification? Its a really cool visitor centre with some very knowlegable volunteers including one who explained Black Holes to Adam using the theory of Relativity. Adam's follow up question: "Are there Aliens" to which the volunteer replied that NASA spent a lot of money trying to answer that question! 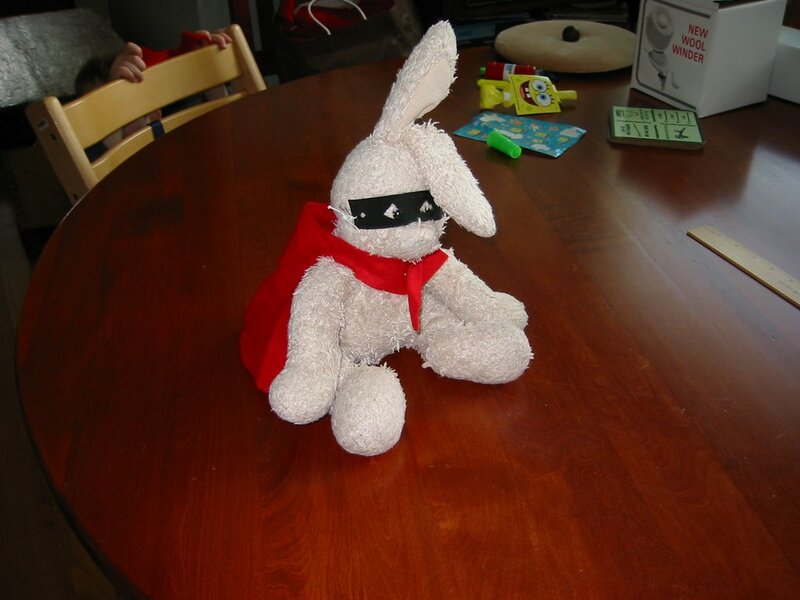 but to satisfy the demand to show finished objects...I give you..."Here's one I made before". I suppose I should eventually get a gallery for finished items, but I'll need to do some wrestling with the technology as I simply dont understand some of the directions. (I guess complete unfamiliarity with html does not help). Anyway - this is not really a finished item yet, but its my first attempt at Kool-Aid dying. Actually it might be my only attempt as it made the entire house smell like fruit drink (not really surprising). 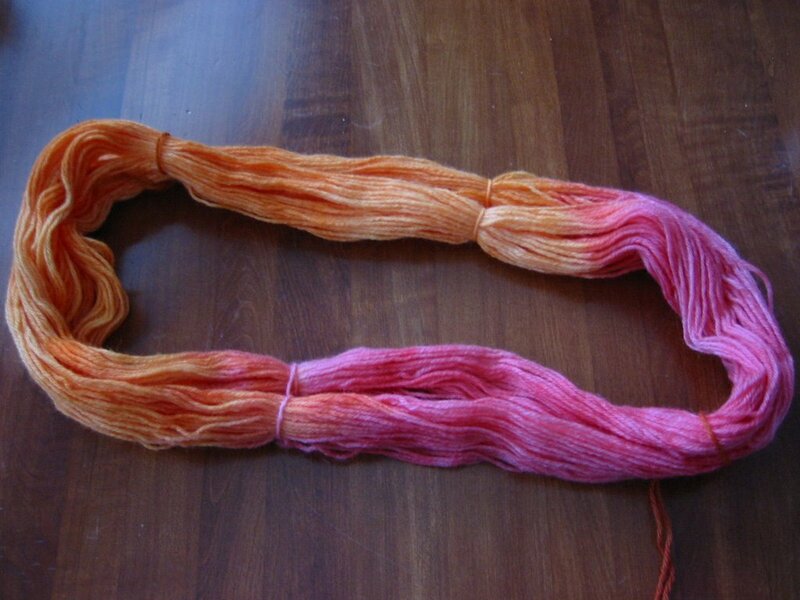 I bought some undyed knit-picks wool and did the dying in 2 stages - first the orange, then the pink. The orange was with 3 packets of some orange-coloured flavour and the pink was one packet of strawberry? cherry? - something red. Each colour took about 4 mins in the microwave and leaked surprisingly little when I rinsed it out after the colouring step. I dont yet know what this is destined to become - I have 220 yards so maybe a tiny shrug or something.